After cycling more than 500 kilometers, 8000 meters in altitude and 10 days we finally arrived in Khorog - in the western part of the south-eastern corner of Tadjikistan. 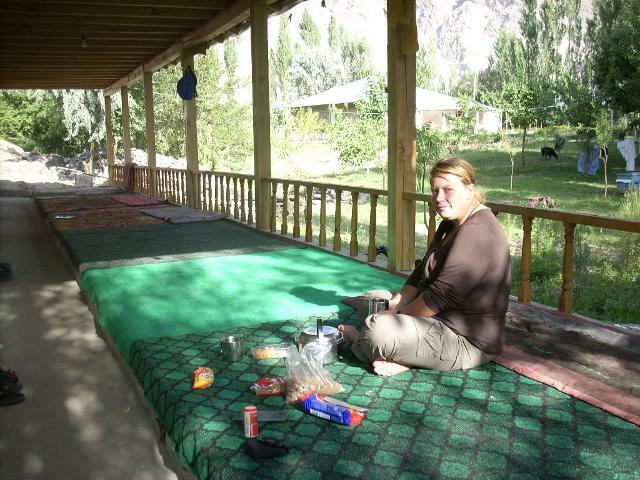 We take a simple but cheap 10-USD room in the Pamir Lodge, do our laundry and clean the bicycles, and enjoy the nice atmosphere and the shady garden of the lodge. There is a great bazar in Khorog, where we stock up food for the oncoming Pamir Highway. Many cyclists stay here. 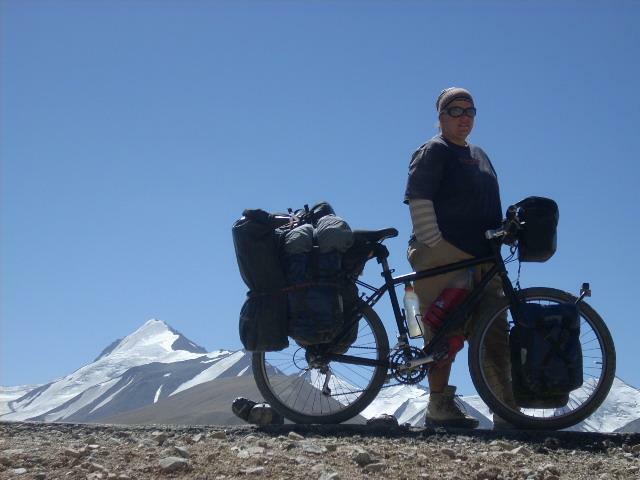 Most of them are “normal” ones, who spend their vaccation to cycle the Pamir Highway or explore some small valleys in the surroundings. Because many of them finish in Khorog in order to take a minibus or taxi back to Dushanbe, some equipment is sold or given for free to other cyclists who are proceeding their bicycle-journey. These people get useful bicycle spareparts or other equipment from the “holiday cyclists”. Also Bine tries to get some better pedals for her bicycle, but most of them are using click-pedals, therefore she did not succeed. 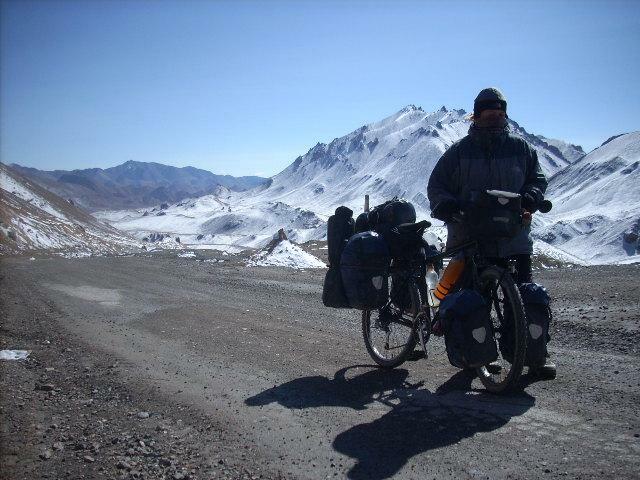 Dirk manages to get some spare tubes with Presta valves and dried food for the high Pamir. Other cyclists get “new” rims or tyres. 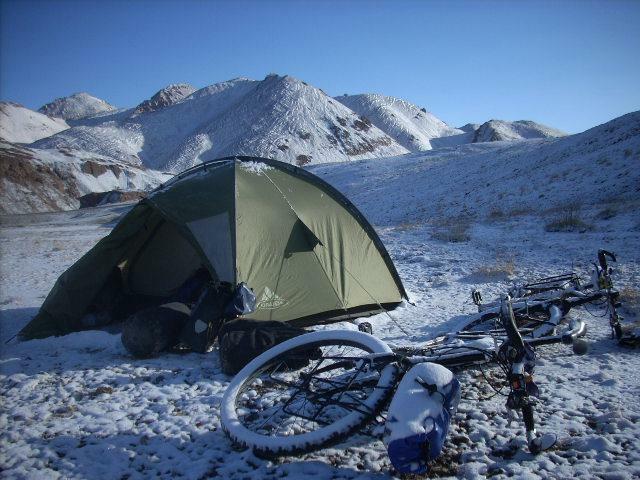 Pamir Lodge is turning into a bicycle bazar! Bine and me are staying two days, preparing mentally and physically for our last leg in Tadjikistan – the famous Pamir Highway, which goes up to Pamir plateau to Kyrgystan, crossing several 4000-meter passes on the way. A good way for “refilling” some energy is Cafe Varka in Khorog. A russian restaurant near Pamir Lodge, very dark inside, every table is lit by one small lamp, on the floor and at the walls they put red carpet. It may look a little bit suspicious and mafia-like on the first glance, but we both enjoyed the atmosphere, the food and at least also the beer (Baltika of course!) every evening. For hours we are sitting there, eat chicken and russian salad, listen to russian popmusic or Enrique Iglesias, drink a lot of Baltikas and talk about our great journey, about the intensive experience we made during the last few weeks and we are planning the next weeks of the tour. This is really nice and we enjoy it very much. On the day before leaving we spend the evening there together with a cycling couple from New Zealand who also go to Kyrgistan but on a different route. Once again we are lifting the Baltika bottles and say cheers to each other – let’s go to the Pamir! On the next we are leaving. Bine and me on our own again – Dirk seperates and wants to cycle alone. We enjoy the “new” independence of being just two. Unfortunately I feel weak from the beginning, the road is ascending very moderate, but I have to mobilize a lot of energy to get on. I realize that I might be sick. On the first day I am heading on, but it is no fun anymore. On the second day I am totally exhausted after 50 kilometers, and we put up our tent at miday next to a garden. I am getting fever, diarrhoe and feeling nausea. The women which are living there are quite shy at the beginning, but after the ice has been broken we get tea and food from them. We invite them for some biscuits. After taking Metrodinazole pills my health is improving. So I actually have Giardia for the first time. 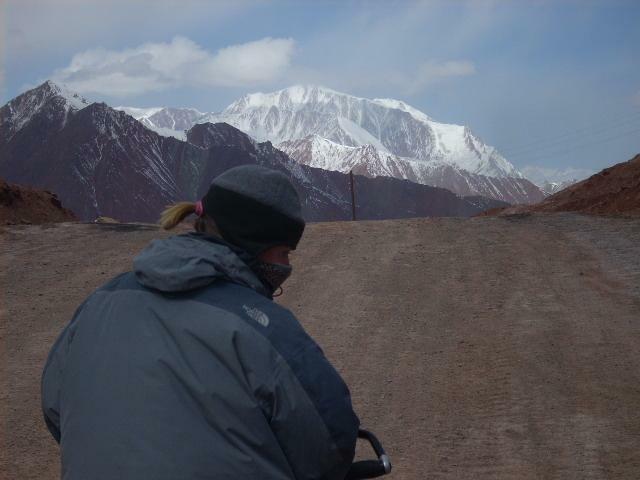 Still weak, but happy to be able to head to the Pamir, I climb up the pamir. Starting at about 2100 meter above sea level in Khorog up to the first pass at 4300 meter. The weather is perfect, as we had the whole time while staying in Tadjikistan. The mountains are now getting higher and higher, the peaks are more often covered with ice and snow, we more often see small glaciers on the steep slopes on the left and right side of the road. Bine and me are enjoying every minute. For both of us, the Pamir is “our Tibet Light” experience, as we most likely will not go through West-Tibet because of problems extending our 1-month Visa, closed Tibet and time of year. Still there are some small villages, also a few shops. This will be the last for a longer period of time - at the Pamir plateau there are just 3 small villages, the rest will be pure loneliness and remoteness. We have been told that we will meet just about three vehicles per day. In the last village before Kaijtezek Pass we try to buy some food, but there is not much to get here. A “magazin” turns out to be just a dark room with some packets of biscuits. So we just refill water and we are heading on. Beneath the pass, at 3900 meters in altitude, we pitch up our tent. We never have problems concerning altitude sickness. Going by own power and “slowly” by bicycle is a very good way to automatically get used to the lesser amount of oxygen. 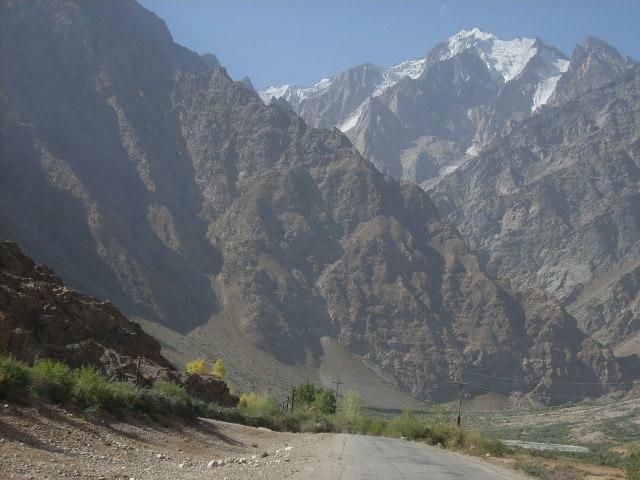 Most parts of the Pamir Highway is paved, just sections before and after the passes are gravel roads. But these sections are quite bad, like roads in western tibet. In average the ascends are very moderate on the highway, but on the unpaved parts, also the ascends are quite steep and exhausting. Before lunch we both reach the pass – 4290 meter above sealevel. We are proud to have cycled all the way from Vienna (Austria) overland to this great place. Just beside the road snow-covered mountains and glaciers, the landscape is moon-like, dry, nearly no green. Going down is the same as in tibet: slow down to 10 km/h in order to avoid damage to the rims on the stony gravelroad and the corrugations. But we do not have to descend much anyway, we go down to just 3900 meter – we reached the Pamir plateau. A second pass on the same day is too much for Bine. Bad gravelroad and very long and steep sections forces her to push her bike up to the pass. Again we are at 4200 meter. The campsites are first class! And easy to find. The information about meeting just 3 vehicles per day is not entirely true, but the traffic is still very low that we do not have to hide ourselves for the night. Since a few years a border crossing between Tadjikistan and China has been opened, and the Pamir highway got more important since then. Every day we see some of the giant chinese trucks, heading from Khorog to the Kulma Pass to China or vice versa. Additionally there are just a few minibuses going to Murghab. So we nevertheless do not count more than about 20 vehicles per day. In Alichur, the first of the three villages on the Pamir plateau, we buy some biscuits, water and chinese soups. In this area of the eastern pamir, the main population is Kyrgyz. 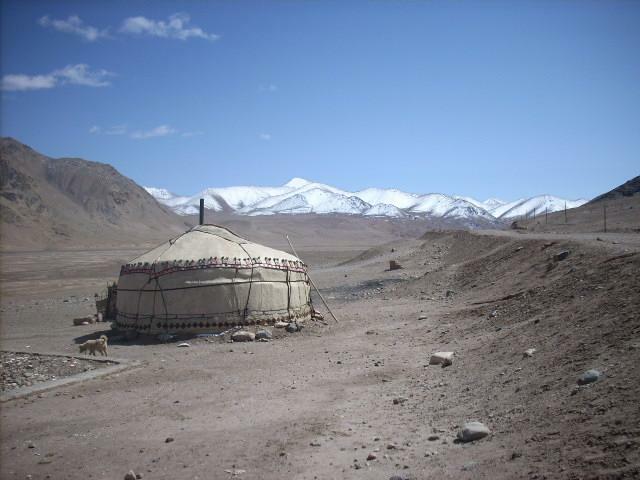 We see a lot of yurts on the plains of Alichur, men are wearing the typical kyrgyz hat. Yaks are grazing on the grassland. Just before Murghab, the second and largest city of the region, our GBAO permit gets checked a second time- This permit is a senseless but expensive (40 USD) piece of paper which allows us to travel in this area. 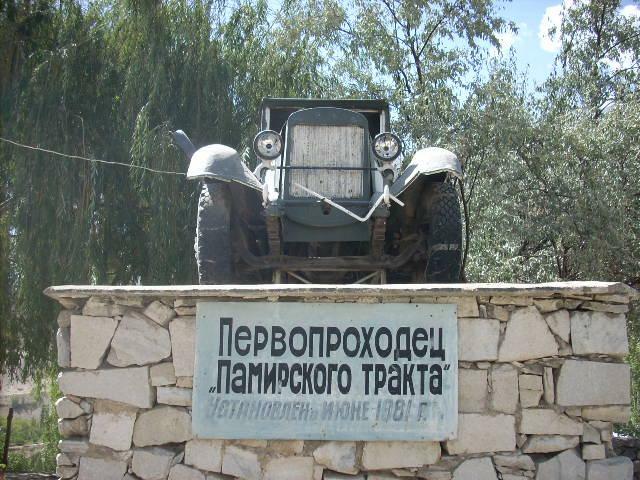 At least – just a few years ago the Pamir highway was closed for foreigners. In Murghab we go the small bazar, and successfully buy additionally some vegetables and also – snicker bars! In a small cafe we eat rice and eggs! We meet 2 travellers, both in the age about 60, but travelling as “cheap” backpackers” on their own. This is impressive for us, we never met people at this age who are travelling in this uncomfortable and unpredictable way. Respect! Oone thing changes after Murghab – the direction of the wind. Since Khorog we mostly had tailwind, but now the strong wind blows directly into the face. Especially in the afternoon the wind turns into a storm. And it then gets quite chilly. That chilly that we have to protect our faces with face guards. Finding now an acceptable place to sleep is much more difficult than before, as we have to find a place which is more or less protected against the cold storm. Therefore we sometimes have to push our bicycles up a steep slope, or we have to cross dry riverbeds to find a good place for our tent. At night the wind in general stops, but it gets cold - freezing cold. In the morning the PET bottles filled with water are totally frozen. And our SIGG aluminium bottles – damaged! But we should have known better, the frozen water cracked the bottles. Bine and me should have taken them at least inside the tent. Akbaital Pass is the highest point along the Pamir highway. And for me most likely the highlight of the whole journey so far, the highlight of the last 6 month. In the evening before we will reach the pass we camp at about 4300 meter above sealevel. Just before the last ascend up to the pass. During the night snow is falling, we are afraid that the road is maybe blocked in the morning. Several times we get rid of the snow which is covering our tent. But at some times snowfalls stops, and on the next morning it happens what I always whished that it would happen – the sky is clear and blue, the sun is shining. And we admire a great winter- and mountain-scenery around us! Though it is quite cold, all water is frozen. But that fact does not stop us get out of the tent immediately to enjoy the panorama and to take some photos. Stunning! The road up to the pass is luckily without snow but quite difficult to cycle. Our bodies “realize” the lack of oxygen now. At the last few hundred meters before the pass I have to stop 3 times to take some deep breaths. And suddenly we are up on the pass. 4655 meter! For Bine it is a new personal record. Great scenery around us and deep blue sky above. That’s it! Hugs, photos, drinking a small bottle of Leibwächter. Like in a dream! Going down is not that much fun. Corrugations and deep gravel on both sides of the road. In a yurt we get some excellent bread, fresh butter and hot tea. That’s exactly what we need now at the moment. Still it is very cold, especially hands and feets are hurting because of cold. But inside the yurt it is comfortable and very warm. 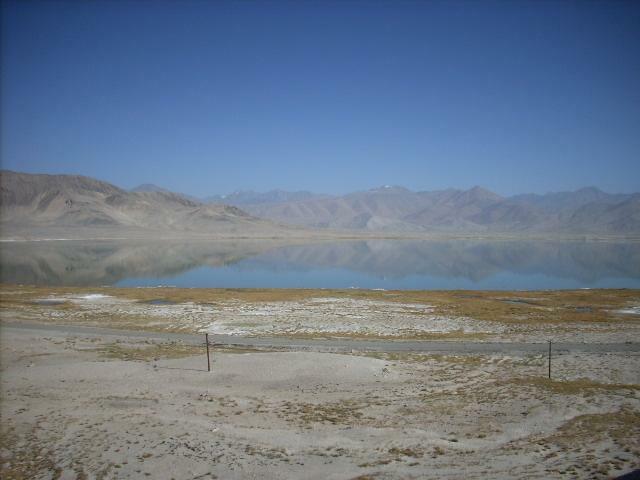 Karakol is a turquoise lake at 4000 meter. In the nearby village with the same name, the last one in Tadjikistan, we take a good breakfast (great noodlesoup and bread) in a “homestay” – that’s how these small, private-run guesthouses for tourists, especially for cyclists, are called. In the backdrop of the lake several, snowcovered 6000 meter peaks. Great! The next pass brings us again up to a level of 4300 meter. The head wind is brutal, my whole body is shaking because of coldness. And although it is going down we have to pedal hard in order to move forward, not backward! We try to go down as fast as possible. Suddenly I see a giant mountain in front. “THIS MUST BE PIK LENIN!”, I am shouting to Bine as the storm is too dominating to speak normally. Pik Lening is a great, 7500 meter peak. Additionaly to the the cold storm my stomach begins to ache and grumble. Within one minute I manage to grab toiletpaper, hide behind a rock and...you can imagine.... Luckily we find a good place for camping which is protected by the wind. Puuh, done! 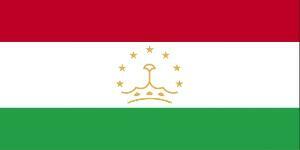 Now we are already very close Kyrgystan. The Tadjik border is at 4200 meter above sealevel. A few run down houses, a few container. Nothing more than this. Beside a yak herd is grazing quietly. This border is opened just during summer, during winter everything here is covered with snow. After an easy border crossing we have to cycle 100 meter up to the Kyzyl-Art pass, the real border between Tadjikistan and Kyrgystan. Unfortunately the mountains are surrounded with clouds, Pik Lenin is very close, and it must be a great view to the peak from here when the weather is good. An icecold wind is blowing and forces us to leave soon. We get on our bikes and go down the awful gravel road to Kyrgystan. We are leaving impressive and great Tadjikistan.